If these Frequently Asked Questions don’t address your issue, please email hpc-support@umich.edu. Please include your job ID number for specific job troubleshooting. How can I start using Flux? In order to use Flux, you will first need a User Account. You can apply for a User Account by filling out this form. A Flux User Account is different from a Flux Account. A Flux User Account is used by a single user to log onto the Flux nodes, whereas a Flux Account is a collection of Flux User Accounts that are associated with one or more Flux allocations. Flux uses two-factor authentication for security purposes, so you will also need to enroll in Duo to be able to log in to one of our login nodes. Once you have a User Account and Duo, you will be able to copy data to your Flux home directory and run small programs on the the Flux login nodes. You will need access to a Flux Account with an allocation in order to run jobs. A Flux Account must be paid for, so this is typically provided by a faculty member or your school or college. How do I log on to Flux? To connect to Flux you should use secure shell (ssh) from a terminal on your computer to one of the Flux login nodes. If you are using a Mac- or Linux-based operating system, you can use the default terminal for this. If you are using Windows, you will need to download a program. One popular program is PuTTY. If you are not logged on to a computer using your uniqname, you should specify your username when connecting. Connecting to a login node with PuTTY on Windows. What is the difference between a compute node and a login node? A login node is a computer that you can connect to directly through ssh. The login nodes can be used to copy files to your home directory and to queue jobs to run on the compute nodes. The compute nodes are where the actual jobs are run. Compute nodes are automatically assigned to a job when a PBS script is submitted to the job scheduler. Which Flux Accounts can I use? If you are a member of the College of Engineering or the College of Literature, Science, and the Arts, you have access to a Flux Account with a College funded allocation. For Engineering, the Flux Account name is engin_flux. For LSA, it is lsa_flux. The ALIST lists all of the Flux Accounts you are authorized to use. Note that some of these accounts might not have an active allocation. Our example user has access to run jobs on engin_flux and FluxTraining_flux. It is important to note that default_flux cannot be used to run jobs and is simply a placeholder. How do I access an existing Flux Account? To be given access to a Flux Account that your group is already using, please have an administrator of that Flux Account send an email to flux-support@umich.edu requesting that you be added. The administrator will usually be the person who pays for the account, or a delegated manager. How many jobs can I have queued or running at once? There can be up to 5,000 jobs per user in each queue (like flux or fluxm). There is no built-in limit to the number of jobs a user can have running at one time, but specific Flux Accounts can have per-user job limits. For example, engin_flux allows a maximum of 10 jobs per user at one time. Portable Batch System (PBS) is the system that the cluster uses to schedule jobs. Users use PBS scripts to specify important information, such as number of processors and memory that a job requires, to the scheduler. Visit this page for more information about PBS. What do I change in my PBS script when running on a different Flux Account? When using standard Flux Accounts, those that end in _flux, you must set the qos parameter and queue parameter to flux in your PBS script. When using Large Memory Flux Accounts, those that end in _fluxm, you must set the qos to flux and queue to fluxm in your PBS script. When using GPU Flux Accounts, those that end in _fluxg, you must set the qos to flux and queue to fluxg in your PBS script. When using Flux on Demand (FoD) Accounts, those that end in _fluxod, you must set the qos to flux and queue to fluxod in your PBS script. When using Flux operating Environment (FoE) Accounts, those that end in _fluxoe, you must set the qos to flux and queue to fluxoe in your PBS script. What security measures are in place for Flux? Multi-factor authentication (MFA) – For all interactive sessions, Flux requires both a UM Kerberos password and an MToken. File transfer sessions require a Kerberos password. The answer lies in the third-party certifications and evaluations that Flux has undergone. IIA has evaluated the system, network, and storage practices of Flux and Globus. The evaluation for Flux is published at http://safecomputing.umich.edu/dataguide/?q=node/151 and the evaluation for Globus is published at http://safecomputing.umich.edu/dataguide/?q=node/155. The Flux support staff is available to help manage user lists for data access, and information is publicly available on how to manage file system permissions, please see: http://en.wikipedia.org/wiki/File_system_permissions. Why can't I connect to Flux from off campus? where the % is the prompt on the login.itd machine. How can I find out my job's status? The status of the job is found in the column labeled with the letter “S”. Why isn’t my job running? I queued my job, but it isn’t running and has a status of queued. Jobs may sit in queued status for a variety of reasons. The scheduler makes batch passes of queued jobs and determines if there are sufficient free resources to run a job, and then runs those that it can. If there are sufficient resources at the time a job is submitted, it may still sit in the queue for up to 15 minutes before the scheduler makes a batch pass and starts the job. If there are not sufficient resources, the job will sit in queue until resources open up. The most common limiting resources are processors and memory. For example, if I try to run a job on a Flux Account that has an allocation with a total of 10 processors and nine are in use, a job asking for two processors will have to wait in queue until another processor is becomes available. Once a processor is freed, the scheduler will assign the job to the two free processors and the job will run. Why does my job have a status of Batchhold? I queued it but it isn't running. Jobs are assigned a Batchhold by the scheduler when they have bad PBS credentials and will not run. Jobs are often given this status when the Flux Account name, qos, or queue are misspelled. Jobs can also be given this status if you try to run on a Flux Account to which you do not have access. If you cannot determine why your job is on Batchhold, please contact us at flux-support@umich.edu with your job number. How many processors or how much memory does my Flux Account have? MAXPROC indicates the total number of processors available to the Flux Account. MAXMEM indicates the total amount of memory available to the Flux Account in megabytes. What jobs are currently running on the Flux Account I use? What does this e-mail mean: moab job resource violation: ``job ####### exceeded MEM usage soft limit``? This message is sent when you use more memory than you asked for (default is 768 MB per core). You can request additional memory by adding “#PBS -l pmem=###MB” to your pbs file, which will ask for ###MB of memory per process asked for (i.e., if you asked for 2 nodes with ppn=2 and pmem=3000MB, you will have asked for 12000MB of memory total). This is not in addition to the default, but replaces it. How can I specify processor and computer layout with PBS? There must be exactly N processors on each computer. 1. If it does not matter how the processors are divided among the computers, you should use the procs property. Using the procs property usually allows for an eligible job to run with the shortest time queued. Flux is a heterogeneous cluster with computers of varying number of processors. Because of this, asking for a specific computer/processor combination may cause delay in your jobs starting. 2. If you would like a minimum of M processors on each computer, you should use the nodes property in conjunction with the ppn property. Here, nodes is used to assign a group of M processors all to the same physical computer. The number of groups of M processors is assigned by N. Using nodes in conjunction with ppn does not guarantee that the M groups of processors will all be put on separate physical computers. Because of this, you will get a computer with at least M processors, but you may end up with some multiple of M on a computer. Here, three groups of four processors could all end up on one computer, or groups of four processors could end up on three separate computers or eight processors could end up on one computer while four end up on another. 3. If you want exactly M processors on exactly N computers, you should use the tpn property in conjunction with procs. The procs property will specify the total number of processors to be used across all computers, when using the procs property with the tpn property. Assigning “procs=M” says that you want M processors total, and you want exactly N processors to run on each physical computer. This would give you M/N processors running on N separate physical computers. How do I get my Network File System (NFS) shares, including Value Storage, mounted on Flux? Yes, but only if you use a secure storage solution like Mainstream Storage and Flux’s scratch storage. Flux’s home directories are provided by Value Storage, which is not an appropriate location to store sensitive institutional data. One possible workflow is to use sftp or Globus to move data between a secure solution and Flux’s scratch storage, which is secure, bypassing your home directory or any of your own Value Storage directories. Keep in mind that compliance is a shared responsibility.You must also take any steps required by your role or unit to comply with relevant regulatory requirements. use the U-M VPN in order to log in to Flux from off campus. 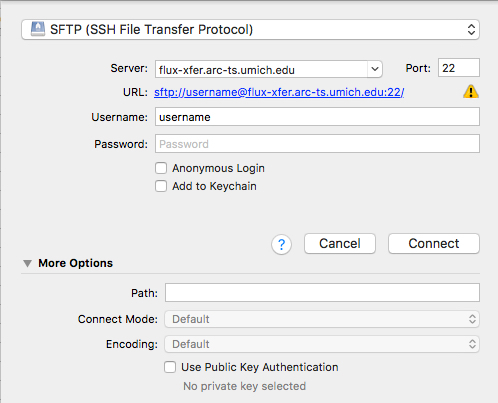 WHY: Flux login is restricted to campus IP addresses. have your jobs read their input and write their output to the /scratch filesystem, WHY:/scratch is much faster and more reliable than your Flux home directory. remember to load any modules your job needs each time after logging in to Flux but before submitting any jobs. Modules that you will always be using can be loaded automatically when you log in by putting the modules into your default module set. WHY: Software will not be available to your job if it is not loaded prior to submitting the job. request 20% more than the maximum memory and maximum walltime you think your jobs might need. WHY: if a job exceeds the requested memory or walltime, it will be terminated before it can finish. use “#PBS -j oe” in your PBS scripts to combine the PBS output and error messages into a single file. WHY: It is much easier to figure out what your job did (you won’t have to match up lines between the two files). submit lots of jobs at once rather than submitting one job and waiting for it to complete before submitting another. WHY: “keeping the queue full” will give you the overall best throughput and utilization for your Flux allocation. perform regular backups of all of your data on Flux yourself, including data in your home directory and in/scratch WHY: If you lose a file, the Flux staff can’t get it back for you. submit interactive jobs using “qsub -I”. WHY: Login nodes have a per-user resource limit of 8GB of memory and even splitting of CPU cycles among users. 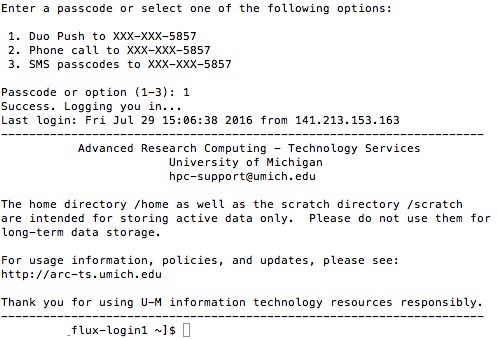 send any requests for help as a new email (not a reply to a previous email) to hpc-support@umich.edu. WHY: You’ll get quicker help if you don’t send email to individuals directly and don’t reply to old (unrelated) support tickets that may be closed already. run “qdel $(qselect -u $USER)” to delete all your jobs if you need to terminate all your jobs. run interactive jobs or do significant computation on the Flux login nodes. WHY: Login nodes have a per-user resource limit of 8GB of memory and even splitting of CPU cycles among users. use /scratch space for long-term storage; files that you’re not using for two weeks or longer should be moved to your home directory or another system. WHY: /scratch is a limited, shared resource; also, no files anywhere on Flux are backed up, and cannot be recovered if lost. run “qdel all” WHY: It will lock up the cluster scheduler for a long time trying to delete jobs that do not belong to you when you do not have the permission to delete them.